“The Jamaican fisheries continued to provide a means of livelihood and a source of protein for some Jamaicans, especially in certain coastal areas. There were 19,685 registered fishers and 5,080 boats operating from 187 landing sites. 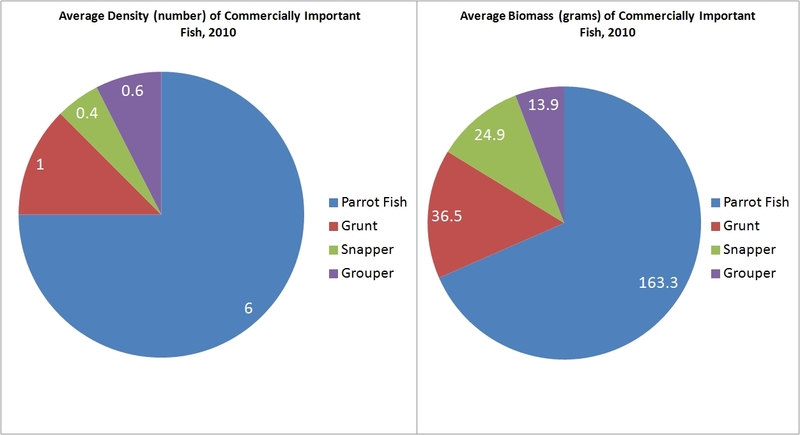 Marine fish production (fish, conch, lobster, shrimp) declined by 13.7% to 11,390 tonnes. The decline in fish catch is partly attributed to plummeting traditional fish fish stocks due to degradation of coastal ecosystems (mangroves, seagrass and coral reefs), pollution from land-based sources, presence of invasive species, and increasing fishing effort. In addition, the long periods of rain during the latter part of 2010… may have redeced the number of fishing days resulting lower fish catches.